We’re all aware of the “Busy Fools” syndrome – high output, high costs, high stress, and high risk. When you’re up to your neck in alligators it’s tempting to just keep ploughing on, Head down, bottom up, you know that you’re wasting time and money but you hope for the day when everything “quietens down” and “gets back to normal”. If customer service deteriorates, this might be self-fulfilling. An IT industry insider once described to me the typical cycle of a high-growth IT business – rapid growth leads to poor service, which slows growth. Service improves, the company grows, service declines, ….. and so the cycle continues. If we can avoid this decline in service levels then we’ll need to accept that things won’t just “quieten down” and that “busy” has become the new “normal”. So we need to know what to do about it. And businesses who are “Quiet” and “Efficient” also need to have effective strategies. “Busy and Inefficient” – the “Busy Fools” scenario. The busier we are, the less efficient we become. Stress levels increase, service declines and productivity tails off. One of our biggest challenges (as a management consultancy and training organisation) is in persuading prospective clients to stop chopping down trees and spend some time sharpening the axe! In this situation very few business leaders have the courage to make everyone “down tools” for a week to transform the way they operate, so we need to find another way. The solution is to spend a couple of hours training staff to identify the main sources of wasted time and effort, to generate improvement actions, and to implement a prioritised improvement action plan. Pretty soon, productivity increases, stress levels are reduced and morale improves. Quiet and Inefficient” – the “About to go out of business” scenario. At this point, massive action is needed to turn around the company’s fortunes. Sales, service and efficiency all need to increase – often with little or no investment available. Fresh thinking is required, often driven by new Leadership. “Quiet and Efficient” – the “All dressed up with nowhere to go” scenario. Being Lean is all about adding value and eliminating waste. Many organisations like eliminating waste but far too few focus on increasing the “value-add”. If you find yourself in this situation then you need to get close to your customers, understand exactly what they value and are prepared to pay for, and find more and more ways of providing this. As part of our work with clients in this quadrant we focus on VAST – Value-Added Sales Techniques. In the longer term, this needs to become part of effective Supply Chain management. 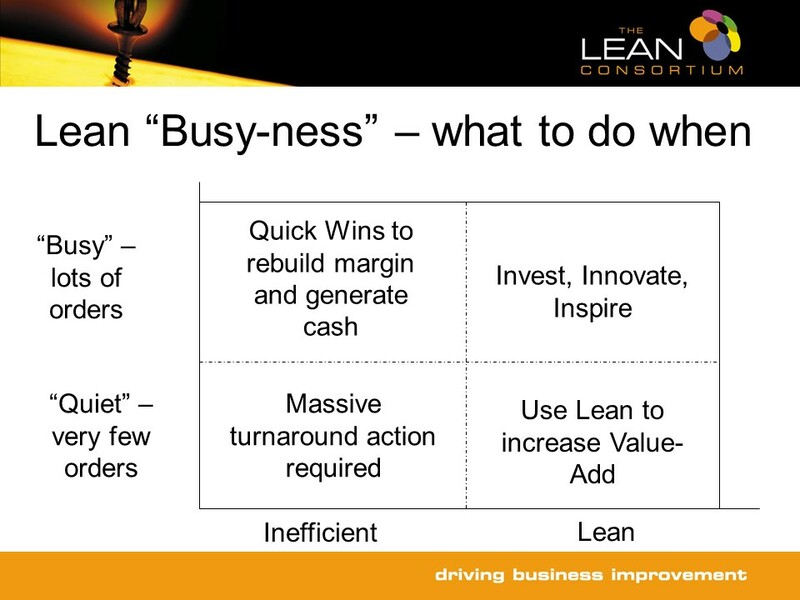 “Busy and Lean” – the “making it look easy” scenario, where most of our clients are! When you’ve truly embedded Lean thinking and Continuous Improvement, the rewards are very clear. Even in a recession, sales increase, margins improve and people still find time to make this month better and more efficient than last month. These World Class organisations invest broadly across the business, they innovate their products and processes, they look to inspire their employees and stakeholders and they understand “why” they do what they do. Whichever quadrant your business is in, if you’re keen to improve contact info@NicholsonConsultancy.com. We can help you add value, reduce costs, and “work smarter not harder” – all at the same time!